Kevin Harvick became “The Closer” once again for the second time this season, passing Martin Truex Jr. in the final laps at Texas Motor Speedway to earn his first career win at the 1.5-mile track. Harvick’s 37th career victory guarantees him a chance to battle for the 2017 championship at Homestead in two weeks. Truex finished second after leading 107 of 334 laps, but the Furniture Row Racing driver still has reason to celebrate. 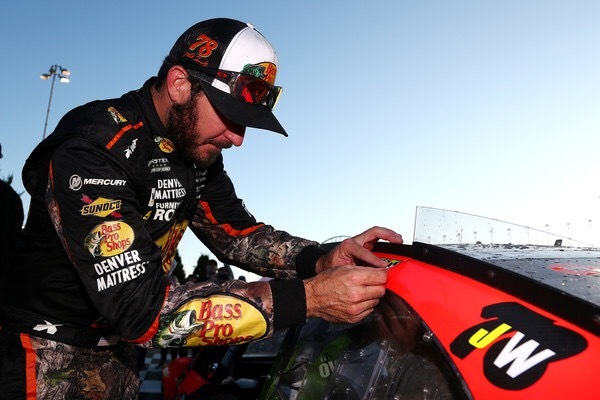 Truex secured his way into the Championship 4 based on points, joining Harvick and Kyle Busch in the final round of the Monster Energy NASCAR Cup Series Playoffs. Matt Kenseth earned his first top-5 finish since Loudon in September, one day after saying that he will likely step away from Cup full-time at season’s end. He led 29 laps before finishing fourth. Kyle Larson hit the wall and ended up in flames on Lap 282. The incident was the driver’s third weekend in a row which ended in finishes of 37th or worse. Last week’s winner and Brad Keselowski were also faced with trouble on the first lap of the event. The two made contact and were forced to pit to access damages. Keselowski rebounded and finished fifth, while Busch had additional issues on Lap 275. He finished in the 19th position. The Monster Energy NASCAR Cup Series head to Phoenix Raceway on Sunday, November 12th to set the field for the Championship 4. Five different drivers (Keselowski, Hamlin, Blaney, Elliott, and Johnson) are left with only one spot available. Who will advance? Find out on November 12th at 2:30 p.m ET on the NBC Sports Network. 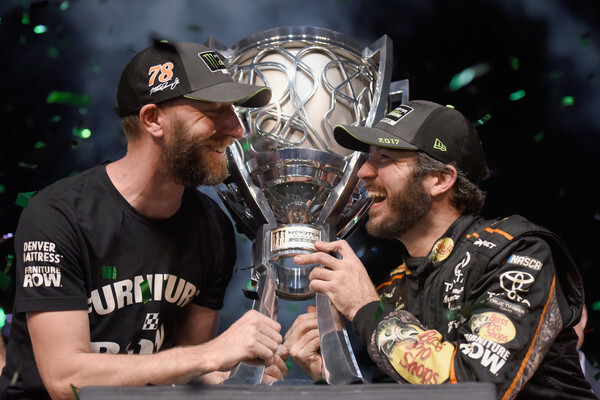 Martin Truex Jr. has battled many obstacles during his 14 years in the Monster Energy NASCAR Cup Series. He overcame them once again Sunday, earning his seventh trip to Victory Lane this season. Truex, who started from the pole, received a restart penalty in the early stages of the Hollywood Casino 400 after the Furniture Row Racing driver went below the white line before reaching the start/finish line. Truex remained on the lead lap after serving a pass-through penalty, but an unscheduled pit stop on Lap 91 put them one lap behind the leader. Truex became the first driver in history to sweep both races at Kansas Speedway, just hours after the sudden death of road-crew fabricator Jim Watson. Four drivers were eliminated from advancing into the Round of 8, ending their chance of becoming the 2017 champion. Jamie McMurray, Ricky Stenhouse Jr., Matt Kenseth, and Kyle Larson were among the bottom four at the conclusion of the second elimination race of the MENCS Playoffs. Larson, who was third in the standings coming into the weekend, failed to advance after the engine in his No. 42 Target Chevrolet expired during Stage 2 of the event. As a result, Larson finished in the 39th position and ninth in the standings – nine points behind defending champion Jimmie Johnson. Johnson went through his own troubles that put his chances of an eighth championship in jeopardy. The Hendrick Motorsports driver spun twice within five laps, but received a break on Lap 198. Kenseth, who was 1 of 14 involved in a crash, was parked by NASCAR after having too many men over the wall working on the No. 20 Toyota. Kurt Busch finished second, his best finish since winning the Daytona 500 in February. Ryan Blaney finished third, while Chase Elliott and Denny Hamlin rounded out the top-5. Chris Buescher finished sixth to match his best finish of the season at Michigan in August. Dale Earnhardt Jr. finished seventh, his seventh top-10 of the season. Kevin Harvick and Aric Almirola finished eighth and ninth, respectively. Kyle Busch finished 10th. The Monster Energy NASCAR Cup Series head to the Paper Clip on Sunday, October 29th to kickoff the third round of the Playoffs. Coverage at Martinsville starts at 3 p.m ET on the NBC Sports Network.